Who buys Kitchen Shack Kitchens? 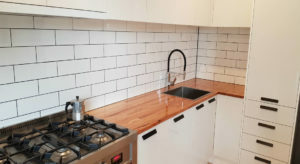 Our DIY kitchens have been developed to suit anyone, home renovators, small home builders, holiday house owners, investment property owners and anyone wanting to update their kitchen on a budget. Does Kitchen Shack offer all sized cabinets to fit in my kitchen space? All our widths and heights of cabinetry can suit any kitchen space perfectly. We also have special colours on request to suit everyone’s needs. Best of all our range is fully assembled to save loads of time. A small Kitchen Shack Kitchen starts at $3,500 and a large Kitchen Shack Kitchen may cost $15,000, the average kitchen cost is around $6,000-$8,000. What if I have just received a quote from a cabinetmaker for $8,000 and Kitchen Shack have quoted $6,000, does this mean I am compromising quality with Kitchen Shack? Definitely not! Our quality systems ensure quality products and in fact, may embarrass the more expensive competitors. When comparing kitchen quotes be sure to compare kitchens of equal quality. If Kitchen Shack don’t compromise on quality then how can they be so cost effective? The state of the art manufacturing supplier systems ensures production costs are kept to a minimum so we can pass this onto you. Because we are supplying so many kitchens it provides strong buying power with suppliers. Customers save by playing a role in the process such as bringing their measurements into the showroom for a free design. How does Kitchen Shack compare to other DIY kitchen providers? Fully Assembled Quality – materials and workmanship are fully assembled for an easier renovation and all produced using high quality. Price -*Lowest prices guaranteed – we will beat any price for the same product and service by 5%. Availability – Kitchen Shack’s manufacturing supplier is based in Melbourne and guarantees a scheduled delivery time. Suit any Home – our kitchens can be designed and manufactured specifically for your kitchen space. Australian Proud – products made and company family owned in Melbourne. I am not a diy or handyperson does that matter? Kitchen Shack kitchens come fully assembled making them easy for any person to install. We supply a step-by-step instruction manual and an instructional video. We find that 98% of our customers use a registered installer and trade of their choice making the kitchen project easier and quicker. How do I design my kitchen? That’s easy. Our kitchen designers will design your kitchen in the showroom for FREE to be both functional and stylish. All you need do is bring your plan or measurements into the showroom and spend 2 hours with our Designers to discuss and view your design. Can I install the kitchen myself? Of course, you can. Alternatively, a registered professional can install much quicker and cause less disruption to the home. It is important to remember a kitchen or laundry renovation can cause lots of stress so our customers prefer registered professionals to install. Should you choose to install Kitchen Shack will provide an Installation Guide and a video for you to watch to ensure you install the kitchen correctly. Definitely – we back our product with a 10-year guarantee and a lifetime warranty on hinges. Can Kitchen Shack products be used in other areas of my home? Yes. The cabinets can easily be adapted to use in the laundry and other areas of the home. We often find customers do both their kitchen and laundry at the same time to save costs and time hassles with renovations. This is a very important question. By visiting showrooms and viewing the products you can then visualise what you like and most importantly what would suit your home. We have 3 showroom locations in Preston, Kilsyth and Maribyrnong. Where do I start with my DIY Kitchen Renovation? First we would suggest you Download the Design Guide which is an excellent source of information. This Guide provides step by step information including a checklist that is perfect for explaining how to measure your kitchen space including window, fridge, appliance spaces etc. All that is required is a rough drawing with all measurements so the Designer can design your kitchen or laundry to your needs and provide an on the spot quote. Of course there is the option for you to organise a final check measure following your order. Bookings are essential. Our kitchen showrooms are busy and we don’t want you sitting around if we are designing someone else’s kitchen. You can book a design online or telephone the kitchen showroom closest to you.